President Dmitry Medvedev paid a visit to California on Wednesday where he gave special attention to Silicon Valley in an effort to boost US-Russian economic relations - and even sent his first tweet. Over 200 years ago, the Russian-American Company, Russia’s first joint stock company, was establishing trade posts along the Pacific Coast as economic opportunities with the young American country were beginning to show signs of promise. The southernmost Russian establishment was called Fort Ross, which is today a scenic park situated in Sonoma County that represents an intriguing piece of shared history between the two countries. It also speaks volumes about the enduring nature of the US-Russian relationship that Dmitry Medvedev chose to begin his US tour by helping to keep this financially strapped park afloat. California Governor Arnold Schwarzenegger, who personally welcomed Medvedev on his arrival to America’s most populated state, decided earlier to slash funding of Californian national and historical parks due to an acute budget crisis. On Wednesday, Schwarzenegger and Renova Group CEO Viktor Vekselberg signed in the presence of President Dmitry Medvedev an agreement that will help to preserve Fort Ross from insolvency. At least one million dollars annually will be needed to keep the Fort Ross in a proper state, Vekselberg told reporters after a singing ceremony of the memorandum. The Californian governor thanked Vekselberg and Renova Group for their generosity. But the real purpose of Medvedev’s California visit was to promote economic relations between America’s most dynamic economic state and Russia, which is looking to overhaul its manufacturing base and diversify its oil-dependent economy in favor of sleek, cutting-edge technologies. Schwarzenegger stressed his enthusiasm for working side-by-side Russia, especially at a time when some economists recently compared California with Greece, which was forced to go begging for money from the International Monetary Fund in order to avoid full-blown bankruptcy. At the end of last year, California had accumulated $83.5 billion in long-term bond debt, with about three-fourths of that amount in the form of general obligation notes, which are financed by the state's general fund. But despite California’s questionable bill of health, the vibrant state remains a magnet to hundreds of hi-tech companies that are helping to power the American economy through its worst economic recession since the Great Depression. 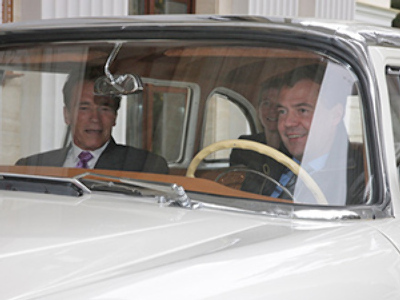 Schwarzenegger expressed his desire in promoting cooperation between his state and the Russian Federation. Medvedev paid a visit to dynamic Silicon Valley where he met with the heads of some popular IT compnaies, including Twitter, which defines itself as a “micro-blogging” service, as well as Google, the popular search engine portal, before meeting with the US Chamber of Commerce. 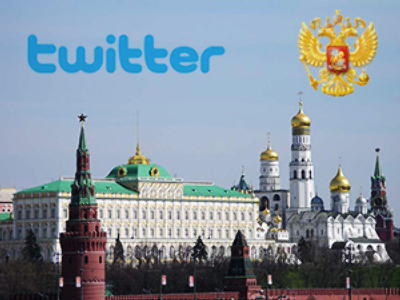 It is now possible to follow the Russian president on Twitter. Medvedev stressed before his arrival that his trip would not be an “excursion,” but rather an opportunity for forging relations with America’s leading technology companies and executives. 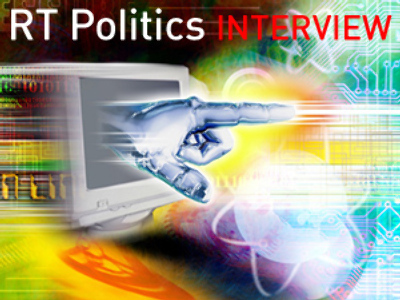 “I would like to see how everything functions there. It will not be an excursion. I would like to establish fully-fledged relations as a result of this trip,” he said. Silicon Valley, located near San Jose, California, is a name that has been given to the region due to the prevalence of silicon chip innovators and manufacturers. Today it is a world leading high-tech hub. The Russian president also gave a speech at Stanford University. Following the precipitous collapse of the Soviet Union in 1991, Russia watched from the sidelines as many of its brightest minds bolted for the emergency exits in search of fatter paychecks and career opportunities. But today, with the country posed for a dramatic economic revival thanks in part to robust oil reserves, as well as a modern approach to doing business, Russia hopes to entice some of its talented emigrants back to the Motherland, while providing attractive incentives for keeping its IT wunderkinds gainfully employed at home. Medvedev, 44, has displayed a personal affinity for social media as a way of reaching out to Russia’s 142 million-strong population. He maintains an Internet video blog and holds regular Q&A sessions through the use of email and video-conferencing technologies. 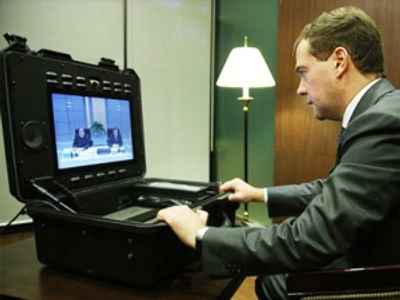 During the Russian president’s state of the nation address to the Federal Assembly, Medvedev mentioned the importance of Russia establishing a research and technological center similar to Silicon Valley. Russia already has several intellectual centers comparable to Silicon Valley. The best-known is Akademgorodok (Academy Town), which is located about 20 km from the city of Novosibirsk. The town was founded in 1950 under the auspices of the Soviet Academy of Sciences. Today, it remains a bustling intellectual hub that hosts about 35 research institutes, including the Budker Institute of Nuclear Physics and the Institute of Cytology and Genetics. The Siberian science city even got an honorable mention in The Wall Street Journal. Russia is also investing heavily in Skolkovo, a modern technology campus situated just outside Moscow. With budget allocations in the hundreds of millions of dollars, the project has attracted the interest of entrepreneurs and scientists. Last week in St. Petersburg, Russia secured a pledge from Silicon Valley's Cisco Systems Inc. to participate in the ambitious venture. 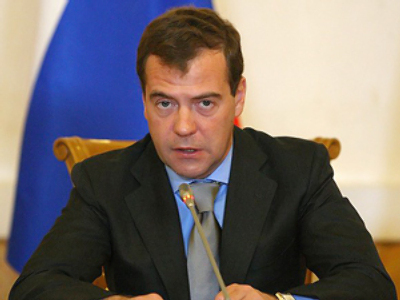 Medvedev is now in Washington where he will meet with US President Barack Obama. The leaders plan to discuss the coordination of the START ratification, disarmament and non-proliferation and key international and regional issues, including the situation at the Korean Peninsula, as well as in Iran. "These full-fledged talks will cover the matters of bilateral relations and basic international problems," Russia's presidential aide, Sergei Prikhodko, told reporters. The two leaders will then travel to Canada for the G8 and G20 summits.